The Nikon D810A is a full frame DSLR pro camera with 36.3megapixel dedicated to astrophotography. It comes with a specialized IR cut filter which captures the red tones. This professional camera has no optical low pass filter. Nikon D810A shoots ultra-long exposure. It snaps up to 900 seconds with a built-in time lapse. Enjoy interval shooting and unlimited continuous shooting. Nikon offers free downloadable Capture NX-D software. It has an Astro Noise Reduction filter to eliminate pixel artifacts without sacrificing its ranking. This pro camera comes with the same body as the D810 which feels good in the hand. It is weatherproofed and with a proper handgrip. The side of Nikon D80A is surrounded with rubber texture. This professional DSLR camera is well built if you are going to use it for the extended purpose. It’s great equipment for outdoor shooting. In playback, Nikon D810A has a zoom display. This helps you view images at 100% making it easy to see when an image is sharp. Another great feature you will love on Nikon D810A is its ‘Split Screen Display Zoom’. You will be able to view two areas of the image magnified while taking the photo in Live View mode. This pro DSLR has a quiet shutter mode. It dampens the noise of Nikon D810A shutter. The Nikon D810A is described as not suitable for general photography by some people. It is because it records red tones of H-alpha emission nebula. Nikon D810A is four times more sensitive than conventional pro DSLRs. To use Nikon D810A for general use, you have to attach an IR cut filter at the front. Alternatively, you can use a dedicated infrared filter for blocking visible light. You can shoot infrared photos as well. Not like the D810, Nikon D810A can record videos at full HD 1920 X 1080. It records at 24p, 25p, 30p, 50p, and 60p. The camera comes with a microphone and headphone sockets. You can record good quality stereo sound. Just like any pro camera, Nikon D810A can create time-lapse videos in-camera. You can produce a video for cinema or TV on this professional DSLR. This is because it supports color grading options. Enjoy more working time with extended battery life. It can last 1200 shots basing on Nikon/CIPA test results. 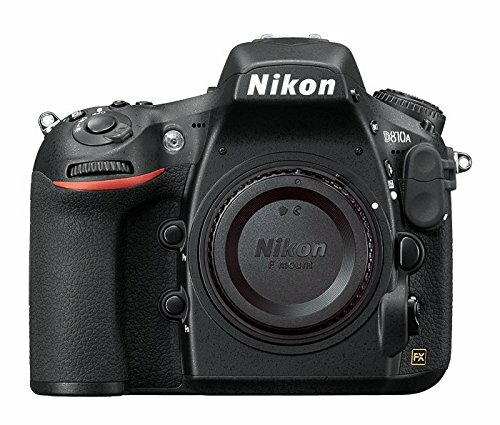 The Nikon D810A is a specialized version of the regular D810 that has been modified for specific types of astrophotography. The infrared (IR) cut filter has been optimized to allow transmission of the hydrogen alpha spectral line, resulting in four times greater sensitivity of the 656nm wavelength.